For the 2013 Off-Broadway musical, see Far from Heaven (musical). Far from Heaven is a 2002 American period drama film written and directed by Todd Haynes and starring Julianne Moore, Dennis Quaid, Dennis Haysbert, and Patricia Clarkson. It premiered at the Venice Film Festival, where Moore won the Volpi Cup for Best Actress and cinematographer Edward Lachman won a prize for Outstanding Individual Contribution. Frank often finds himself forced to stay late at the office, swamped with work. One night when Frank is working late, Cathy decides to bring his dinner to him at the office. She walks in on him passionately kissing another man. Frank confesses having had "problems" as a young man and agrees to sign up for conversion therapy. However, his relationship with Cathy is irreparably strained, and he turns to alcohol. Cathy runs into Raymond at a local art show and initiates a discussion with him about modern painting, to the consternation of a few onlookers. One night, after a party, Frank attempts to make love to Cathy. He is unable to become aroused and strikes Cathy when she tries to console him. Cathy decides to spend a day with Raymond. They go to a bar in the black neighborhood in which she is the only white person present. Raymond toasts her with a drink, saying, "Here's to being the only one." They are seen together by one of Cathy's neighbors, who immediately tells everyone. The town is soon ablaze with gossip about the two of them. This becomes evident when Cathy attends a ballet performance by her young daughter and the mothers of the other girls prevent them from socializing with Cathy's daughter. Cathy's husband is also furious. Cathy goes to find Raymond to tell them that their friendship isn't "plausible." Over the Christmas and New Year's holidays, Cathy goes on a vacation with her husband to Miami to take their minds off of things. At the hotel, Frank has another sexual encounter with a young man. Back in Hartford, three white boys taunt and assault Raymond's daughter, Sarah. Frank tells Cathy that he has found a man who loves him and wants to be with him and seeks a divorce from Cathy. When Cathy eventually finds out that the victim of the attack was Raymond's daughter, Sarah, she goes to the Deagan home to find them packing up in preparation to move to Baltimore. Ever since the incident, he's been getting rocks thrown in his windows, as the African American community is not taking the mixing well. At one point when he addresses her as "Mrs. Whitaker", she begs him to call her Cathy. She suggests they can be together now that she is to be single. Raymond declines, saying "I've learned my lesson about mixing the two worlds." Ultimately, Cathy goes to the train station to see Raymond off and say her silent goodbye to him, waving to him as the train moves out of the station. Haynes wrote the script envisioning Moore and James Gandolfini as Cathy and Frank, respectively. While Moore joined the project immediately, Gandolfini was unavailable due to The Sopranos. Haynes' next choice, Russell Crowe, believed that the role was too small, and Jeff Bridges wanted too much money. Far From Heaven focuses on several controversial issues of the mid-twentieth century, including racism, miscegenation, as well as views on homosexuality, and the stigma of escapism during that time period, presenting these issues through the mise-en-scène and cinematographic conventions of a 1950s style melodrama. Utilizing the nostalgic mechanisms of a polished, period melodrama, Far From Heaven challenges the typical sanguine nature of the genre in an effort to highlight the central conflicts of its main characters, Cathy and Frank Whitaker, while also simultaneously shattering the wholesome image of American life during this time period, which is typically romanticized in American culture. Todd Haynes, the director of Far From Heaven, employs these tactics and others such as lighting and music to highlight these pivotal developments, and to further not only the plot of the story, but to create a sensory experience for the audience that lulls them into what appears to portray an idealized version of 1950s suburban American family life, but proves to be far from it. Throughout Far From Heaven, one of the central conflicts faced by the main protagonist Cathy Whitaker comes from her attraction towards Raymond Deagan, the son of her recently deceased gardener, and how it develops in the face of her estrangement from her husband, Frank Whitaker, as he deals with his developing homosexual tendencies. Set in the fall of 1957 in Hartford, Connecticut, the racial tensions emblematic of the era are reflected right away in the first scene Raymond makes an appearance, tending to his father's former duties as the Whitaker's gardener. While Cathy is being interviewed for a society circular in her living room, she notices Raymond mulling around in her yard, and immediately becomes frightened, uneasy by the prospect of an unfamiliar colored man. While her interviewer Mrs. Leacock suggests calling the police, Cathy walks outside to confront him and learns the circumstances of the situation and how he came to be there, apologizing for her assumptions and demonstrating her capacity to see beyond his race and show sympathy for his recent father's passing. This is an action that is observed closely by Mrs. Leacock through the window, and ultimately makes its way into her article profiling Cathy and her "kindness to negroes". Presenting this particular issue so early on in the film, there is a clear contrast drawn between Hartford's suburban idyllic autumnal setting, and the reality of the social order that dominates everyday life of the Whitakers and the people in their lives. As Frank's difficulties continue to develop, Cathy finds great solace in befriending Raymond and ultimately comes to develop feelings for him as a result. These feelings however prove to be a huge social taboo in this time period and are met with anger and prejudice in affluent New England. With the developing historical events of the Little Rock Crisis serving as the contextual backdrop to the struggle of Far From Heaven, it is in this struggle that one of the central themes of the film comes to the forefront, and is continually reintroduced through segregational policies of the era. Over the course of the film, we observe not only Cathy and Raymond's interactions being highly scrutinized by the different members of their own respective communities, but also examples of Jim Crow practices that are commonplace during this era, such as being unable to sit next to each other at a local lunch counter. Frank and Cathy's vacation to Miami exemplifies this when a young African-American boy jumps into the hotel pool where Cathy and Frank are vacationing. Not only is the boy swiftly removed from the pool, but the white guests who were swimming at the time rapidly exit the pool area in disgust, mortified that the water and surrounding area had been shared, and therefore tainted by someone of color. "Implicitly, this scenario illustrates white Americans’ fear of black bodies, bodies that for whites symbolize "contamination"; and "contamination" in turn signifies the underlying fear of miscegenation. The camera moves between Cathy’s point-of-view looking out at the pool, and then the camera turns and focuses directly on Cathy so that she becomes the object of the gaze. Her eyes remain half-hidden behind sunglasses, which act as shield and mirror. As the unfolding action is miniaturized and reflected—indeed, doubled—on Cathy’s lenses, the message is that this drama turns back on Cathy, illustrating in a rather didactic manner the futility of her desire for Raymond, a black man. The emphasis on parenting here, with a black father and white mother "saving" and disciplining their respective children, further emphasizes the undercurrent of segregation as policing the boundaries of racial reproduction." Frank Whitaker's tribulations with his sexuality is no doubt one of the more pivotal thematic story elements within Far From Heaven, as it sets in motion a series of events in the film that ultimately culminate in not only the estrangement of his wife, but the inevitable failure of his marriage. Characterized as the reliable husband, the successful hardworking businessman, the charming spouse, and the devoted father, he is idealized in a way that assigns him so many demanding roles, it is almost as if he is driven to pursue his homosexual tendencies as a means to escape his taxing everyday life, releasing his burden and frustration. We witness this early on in the film in his office job at Magnatech, with lunch meetings and dinner meetings piling up his schedule as portfolio season is well underway and his New York office continues to push up deadlines. Much like Cathy, Frank too falls short of his highly exalted reputation, and as he is exploring Hartford one evening, avoiding returning home by taking in a movie, he soon finds himself walking the streets, delving further into the seedy underbelly of Hartford nightlife where he hopes to find what he is looking for. It is when he notices what appear to be two gay men walking into a basement bar that he finally acts on his impulses and begins the slippery slope of self gratification that ultimately comes to dominate his lifestyle. It is through these humble beginnings that we come to explore with Frank the subversive and hushed nature of the gay community as he begins to act on his desires. "The 1950s is a time of constraining expectations; everyone is expected to lead perfect suburban lives, and those that deviate are socially condemned. Haynes sets this up in Far From Heaven, where Cathy appears to have a model life: two children, a successful husband, and a suburban home. She is a typical housewife, admired by others: "Women just like yourself, with families and homes to keep up." This is dismantled in the premise, when Cathy receives a call from the police station regarding her husband. Beauty and perfection, here, are forms of oppression. The props are also important to observe as symbols of the 1950s: the television manifests the suburban prosperity that characterizes the time period. Cathy must adhere to the narrow and confining gender roles of the 1950s, just as Frank must suppress his homosexual desires. These characters, disillusioned in their seemingly flawless worlds, ultimately find these symbols as oppressive." "The "mirroring" technique occurs several times and is a visual clue as to the parallels the film draws between interracial romance and homosexuality. [...] The two instances of "coming out" in Far from Heaven produce different narrative trajectories, and the mediating factor of racial difference accounts for these divergent outcomes. This difference in outcome is based in the notion of visibility—racial difference cannot usually be hidden. The film communicates that heterosexual, interracial desire could, in a sense, be seen as even more "queer" than homosexuality, at least in the context of queerness as visible deviance." Although Cathy finds herself isolated in the end of the film, a divorcée fallen from grace who now devotes her life to her children and her volunteer work for organizations such as the NAACP, she still however possesses feelings for Raymond that while are now held back, dominate the subtext of the ending of the film without ever needing either character to utter a single word in their silent tear wrenching farewell. Todd McGowen observes of both Cathy and Frank in Relocating Our Enjoyment of the 1950s: The Politics of Fantasy in Far From Heaven, "The point here is not that they enjoy in spite of the widespread disapproval; it is instead that this disapproval enables and fuels their enjoyment. Their time together has the significance it does precisely because the social prohibition does not permit it." According to the DVD director's commentary Far from Heaven is made in the style of many 1950s films, notably those of Douglas Sirk. Haynes created color palettes for every scene in the film and was careful and particular in his choices. Haynes emphasizes experience with color in such scenes as one in which Cathy, Eleanor, and their friends are all dressed in reds, oranges, yellows, browns, and greens. Haynes also plays with the color green, using it to light forbidden and mysterious scenes. He employs this effect both in the scene in which Frank visits a gay bar and when Cathy goes to the restaurant in a predominantly black neighborhood. Blue is also a prominent color depicting Frank and Cathy's failing marriage, as highlighted in both the beginning of the film as Cathy receives a phone call for Hartford police concerning Frank and his "loitering", and as tensions rise to a boiling point when Frank makes his first visit to a psychiatrist to try and curb his homosexual tendencies. It is in the moment where the only profanity in the entire film is used by Frank towards Cathy, further demonstrating the cold and bitterness Frank harbors towards her, perfectly in sync with the color palette that envelops them during this scene. "Generally, we can isolate two strategies of colour design in Far From Heaven. On one hand, Haynes makes straightforward and adroit use of classical convention in a fairly subtle and un-ironic way. On the other hand, moments of strong stylisation reveal a self-consciousness of form that announces its artifice. The film's articulation of an autumnal orange motif exemplifies how Haynes reawakens dormant Hollywood conventions in a rather delicate expressive manner. The more overt manipulation of coloured lighting, however, offers a test case. Red and green lighting broadcasts its artifice and its reference to Sirk, activating an awareness of form that Haynes nonetheless manages to align with our sympathy for his characters. In his extensive use of blue light, though, Haynes exploits conventional motivations and the melodrama's generic tendency towards stylisation to exact a sincere and direct affective charge from colour temperature, in much the way filmmakers had done between the late 1930s and 1960s. His project of self-conscious reference may, in fact, open room for Haynes to renew the classical convention in an emotionally direct way. It is this play between citation and invocation of colour scoring that makes Far From Heaven so compelling." Haynes also uses shots and angles that would have been standard in Sirk's films and era. Cinematographer Edward Lachman created the 1950s "look" with the same type of lighting techniques and lighting equipment (incandescent), and employs lens filters that would have been used in a 1950s-era melodrama. The script employs over-the-top, melodramatic dialogue, and Elmer Bernstein's score is reminiscent of those he had composed 40 and 50 years earlier. The sound, done by Kelley Baker, also uses a lot of foley to make more prominent the sound of rustling clothes and loud footsteps, a sound technique that was used more in 1950s-era film. In the commentary, Haynes notes that he was also influenced by Rainer Werner Fassbinder's film Ali: Fear Eats the Soul. As in Fassbinder's film, in Far from Heaven Haynes portrays feelings of alienation and awkwardness. For example, instead of cutting to the next scene, Haynes sometimes lingers on a character for a few seconds longer than comfortable to the viewer, the same technique used by Fassbinder. Another feature is when Cathy drives her car through town. Rather than filming inside the car as it actually moves, the car is filmed still with artificial backgrounds seen through the windows, reminiscent of older films. On the DVD commentary, Haynes states that one of these scenes re-uses the artificial background first used in a scene from All That Heaven Allows. Far from Heaven has received high acclaim from critics since its release. It holds an 87% "Fresh" rating on Rotten Tomatoes, based on 212 reviews, with an average rating of 8.1/10. The critical consensus states: "An exquisitely designed and performed melodrama, Far From Heaven earns its viewers' tears with sincerity and intelligence." The film was nominated for four Academy Awards: for Best Actress in a Leading Role (Julianne Moore), Best Original Screenplay (Todd Haynes), Best Cinematography (Edward Lachman), and Best Original Score (Elmer Bernstein). At the Venice Film Festival, the film was nominated for the Golden Lion, while Moore won the Volpi Cup for Best Actress and Lachman won a prize for Outstanding Individual Contribution. As an example of the film's favorable reception among critics, Cole Smithey wrote that the "contrast of gritty dramatic material against an idealized — read fascistic — social atmosphere, makes for an enthralling movie experience." Jonathan Rosenbaum named the film a masterpiece and considers it a companion of Haynes' Safe (1995) in its use of "the same talented actress to explore suburban alienation in comparably gargantuan consumerist surroundings." They Shoot Pictures, Don't They?, a website which gathers various critics' polls, finds Far from Heaven to be the 56th most acclaimed film of the 21st century. In August of that same year, BBC Magazine conducted a poll on the 21st century's 100 greatest films so far, with Far from Heaven ranking at number 86. 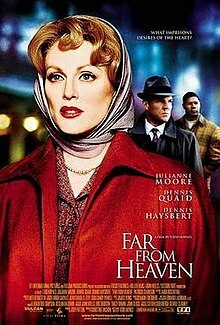 The film did extraordinarily well in the Village Voice's Film Critics' Poll of 2002, where Far from Heaven won for best picture, Moore for best lead performance and Haynes for best director and best original screenplay. Lachman's work in Far from Heaven also won best cinematography by a wide margin while Quaid, Clarkson, and Haysbert were all recognized for their supporting performances, placing second, fourth and ninth, respectively. Far from Heaven was the last film scored by Elmer Bernstein. The album's runtime is 42 minutes and 53 seconds. Theatrical songwriting team Scott Frankel and Michael Korie worked with Richard Greenberg on an Off Broadway-bound musical adaptation. The musical opened at Playwrights Horizons in Spring of 2013. Kelli O'Hara starred in the central role. ^ "FAR FROM HEAVEN (12A)". Entertainment Film Distributors. British Board of Film Classification. November 8, 2002. Retrieved August 17, 2013. ^ Vachon, Christine and Austin Bunn. A Killer Life Simon and Schuster, 2006. ^ a b c d e f Scherr, Rebecca (Spring 2008). "(Not) queering "white vision" in Far from Heaven and Transamerica". Jump Cut: A Review of Contemporary Media. No. 50. ^ a b c d Todd, McGowan (2007). "Relocating Our Enjoyment of the 1950s: The Politics of Fantasy in Far From Heaven". In James, Morrison. The Cinema of Todd Haynes: All That Heaven Allows. Directors' Cuts. Great Britain: Wallflower Press. pp. 114–121. ISBN 1-904764-78-9. ^ a b c d e f g h i j Moin, Mitra (August 2016). "Far From Heaven and Carol: Channeling 1950s Melodrama". Off Screen. 20 (7). ^ a b c d Higgins, Scott (2007). "Orange and Blue, Desire and Loss: The Colour Score in Far From Heaven". In Morrison, James. The Cinema of Todd Haynes: All That Heaven Allows. Directors' Cuts. Great Britain: Wallflower Press. pp. 101–113. ISBN 1-904764-78-9. ^ Yovino, Kirsten (May 17, 2014). "10 Popular Actors Who Haven't Won an Academy Award". The Cheat Sheet. Retrieved November 23, 2018. ^ Smithey, Cole (April 14, 2013). "Far from Heaven — Classic Film Pick". Cole Smithey: The Smartest Film Critic in the World. Retrieved February 2, 2015. ^ Rosenbaum, Jonathan (November 22, 2002). "Magnificent Repression [on Far from Heaven]". Chicago Reader. Retrieved February 2, 2015. ^ "TSPDT - 21st Century (Full List)". They Shoot Pictures, Don't They. Retrieved December 22, 2018.